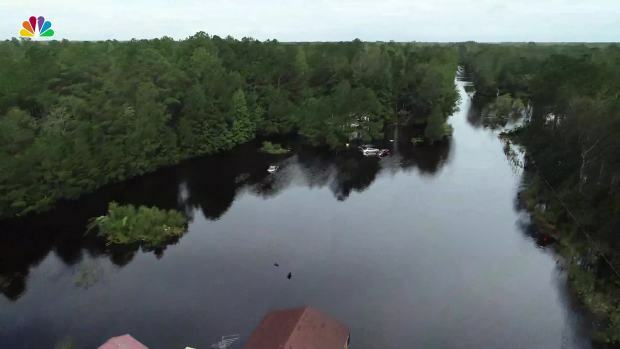 Aerial Footage Shows Devastating Flooding in N.C.
As South Carolina rivers overflowed from Florence's torrential rain, deputies taking two women to a mental health facility drove into floodwaters that swamped their van and trapped the women inside, officials said Wednesday. The two deputies worked to free the women, who were being transported Tuesday night as part of a court order, but were not able to save them from the back of the van, Horry County Sheriff Phillip Thompson told reporters. "I'm not sure if it was the way the van was positioned, against a guardrail, or if it was pressure from the water, but unfortunately they were not able to get the van doors open and get the ladies out," Thompson said. Rescue crews needed about 45 minutes to find the van, which was under water at that point, and plucked the Horry County deputies from the roof, the sheriff said. Officials said the van was in Marion County near the Little Pee Dee River, one of the bodies of water state officials are watching closely after Florence. Because of darkness, responders decided trying to retrieve the women's bodies from the van Tuesday night wasn't safe. That effort resumed Wednesday morning, and Thompson said a specialized crew was being flown in from Charleston to assist. At nearly 7 p.m. Wednesday, State Law Enforcement Division spokesman Thom Berry confirmed the bodies had been recovered. Thompson identified the women as Windy Newton, 45, and Nicolette Green, 43. Earlier Wednesday, Marion County Coroner Jerry Richardson had identified Newton with a different last name. Thompson told reporters that deputies appear to have driven around a barrier blocking the road but the investigation is ongoing. "It hasn't been confirmed to me that they did, but here's my question: There's barriers there. It could be assumed that he did," Thompson said Wednesday. Justin Bamberg, a state lawmaker and lawyer who has represented the families of several people injured or killed by law enforcement officers, said he's perplexed by the decision to transport anyone in such uncertain weather conditions. "If that road is in an area where it is a flood risk, and waters were rising, why were they driving on that road anyway?" he said. "People need to know exactly how it happened. It makes it seem like someone took a very unnecessary risk in creating the problem in the first place." 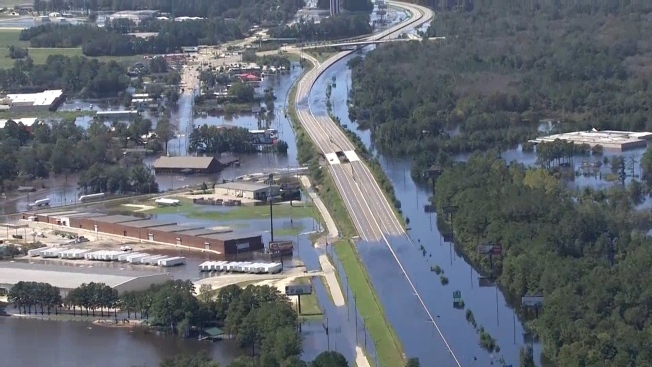 Drone footage shows the extensive flooding around North Carolina after Hurricane Florence. The incident has spawned investigations by the State Law Enforcement Division and Highway Patrol. Thompson said he has also begun an internal investigation and put the deputies involved — Joshua Bishop and Stephen Flood — on administrative leave. A woman who answered the phone at a number listed for Flood told a reporter he didn't want to talk to anyone. There was no answer at a number listed for Bishop. Thompson said he did not think the women were in restraints in the back of the van, noting that restraints are used for combative patients "and I understand they were not." The women had been involuntarily committed by a physician, authorities said. Under South Carolina law, people who have been certified by a physician as posing an imminent risk of harm to themselves by virtue of mental illness and are the subject of an involuntary emergency admission must be transported by law enforcement to whichever designated hospital has agreed to admit them, according to officials with the state's Department of Mental Health. According to statute, the documents authorizing the admission require "a law enforcement officer, preferably in civilian clothes and preferably with crisis intervention training, to take into custody and transport the person to the hospital designated by the certification." The sheriff said his agency acts as a courier in such situations, to follow a judge's wishes. Neither woman has an arrest record in South Carolina, according to documents obtained from state police. Their names also yielded no records in the Horry County jail and court index systems. Newton had posted on her Facebook page that she previously had been hospitalized for mental illness. She posted multiple times about her struggles.